Explore our fine porcelain range created to elevate your chocolate tasting experience, from 3D generated shapes to lustrous crystalline glazes. To complement and heighten your chocolate experience, chef, artist and designer Ryan L Foote has created a luxury porcelain range. 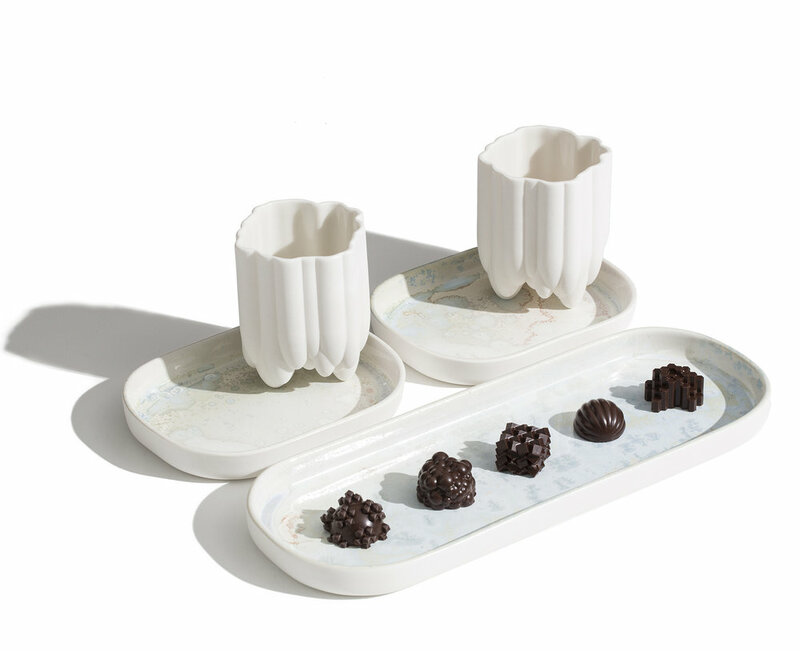 From 3D generated ceramics cups to glazes that reflect the complexity of the tempering process, paired with our chocolates these pieces make for a truly rarified chocolate experience. The first in an ongoing range, Foote has designed a unique chocolate drinking cup made for the perfect hot or iced chocolate. Using 3D printing technologies, Foote has replicated one of his favourite chocolate forms and recreated it in a fine white porcelain. A beautiful tactile object to hold and drink from, this cup is also a a sculptural designer piece. This minimal sleek platter is finished in one of the most complex and fascinating glazes. The process is similar to fine chocolate making, where getting the right crystalline structure and temper is key.